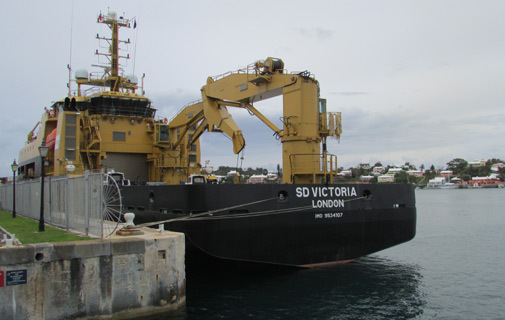 From the outside SD Victoria, which is currently docked in Hamilton, may look like an ordinary vessel. But this military ship transports and houses some of the most extraordinary soldiers in the British Army. Victoria is used to ferry elite Special Services like the SAS and the Special Boat Service (SBS) around the world for training exercises to hone their cutting edge skills. She arrived in Bermuda on Wednesday after completing a six-week deployment in America and the Bahamas. But exact details of her movements and human cargo remain a closely guarded secret. Her captain, Peter Kennedy, told the Bermuda Sun: “We can be sent all over the world to assist training exercises. We have just been to Autec in the Bahamas and previously have supported warm weather trials in the Mediterranean. “We have also been used to support severe weather trials and exercises in the Arctic and Norway. Victoria has a permanent crew of around 16 sailors, including two chefs, but can cater for a further 72 soldiers. She stopped into Bermuda this week so that a new crew of 16 could replace the existing crew before the ship sails back to the UK. Captain Kennedy added: “Working on board SD Victoria is a great experience. “It’s always different and we are always busy.